A mall scavenger hunt is a great way to spend a few hours. 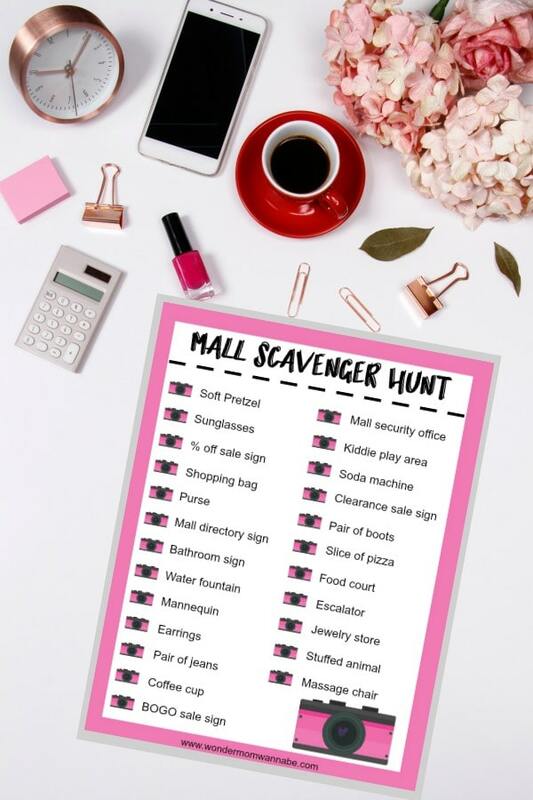 This free printable scavenger hunt list can be used by kids, teens or even adults looking for some friendly competition! It definitely qualifies under the activities for kids category! WHAT IS A MALL SCAVENGER HUNT? A mall scavenger hunt is basically just a scavenger hunt that takes place at a mall. 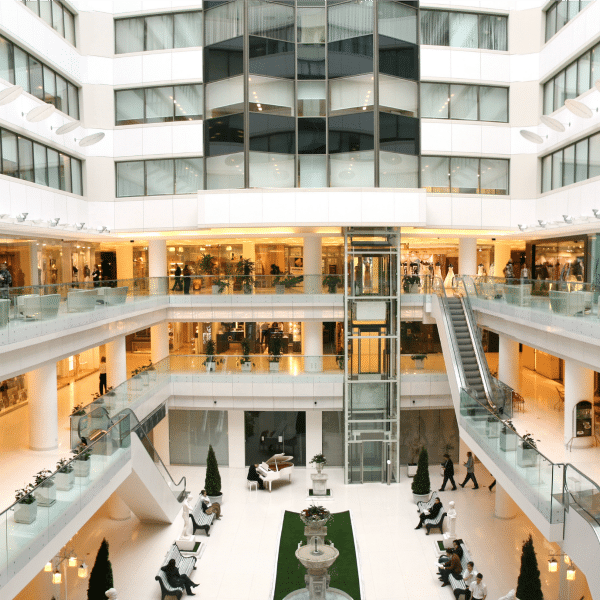 The mall can be a large indoor mall or even outdoor malls would work. The object of the game is to find items that are common in a mall setting. When the person finds an item on the list they will take a picture of it with their phone and mark it off the list. The person to find all the items the fastest will win! INDIVIDUAL OR TEAM MALL SCAVENGER HUNT? Scavenger hunts can be played individually or on teams. I think the team approach is preferred for a mall scavenger hunt especially if children or teens are playing. Safety dictates that kids shouldn’t be alone at the mall! Plus team activities are a lot more fun. Small teams work best for this particular scavenger hunt. Two to four players per team is the perfect number. When doing a team mall scavenger hunt it is a good idea to assign one person the task of taking all the pictures. This will keep all of the “evidence” on one phone and make proving all the items quick and easy. WHAT DO YOU FIND ON A MALL SCAVENGER HUNT? There are really an unlimited number of items you could look for during a mall scavenger hunt. 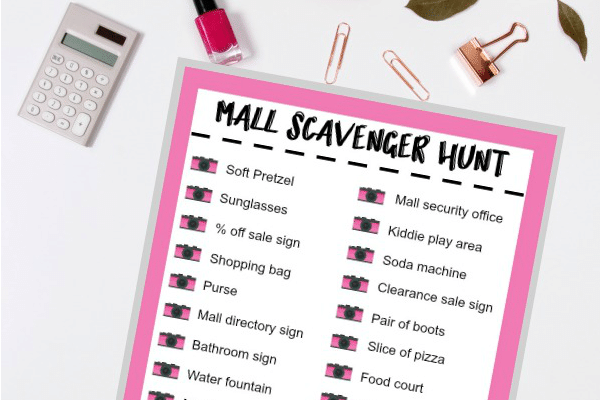 This free printable mall scavenger hunt list has items that should be fairly easy to locate within almost any mall setting. standard items in a mall like escalators, bathrooms, mall map, etc. There is really no limit to the kinds of items you could search out and that is part of what makes this game so much fun. WHO WILL ENJOY A MALL SCAVENGER HUNT? 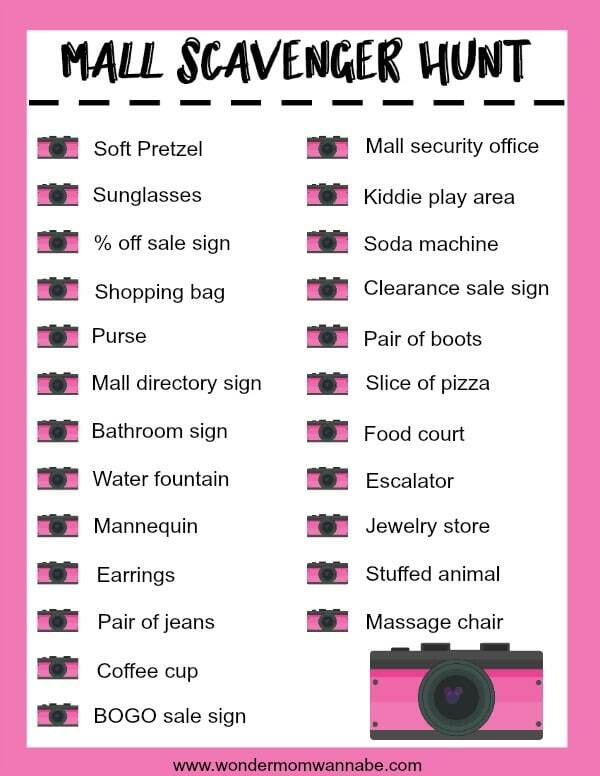 I think anyone can have a great time doing a mall scavenger hunt. This could be a fun way to pass some time after the family goes out to shop for new shoes or school supplies. If the kids behave during the shopping portion then the family can have some fun afterwards. Tweens and teens will get a big kick out of this activity. They love being at the mall, but typically don’t have money to spend so this is a way to pass time and have some laughs in a safe atmosphere. This scavenger hunt would be really fun as a birthday party activity too! The main component needs to be people who like to have fun! 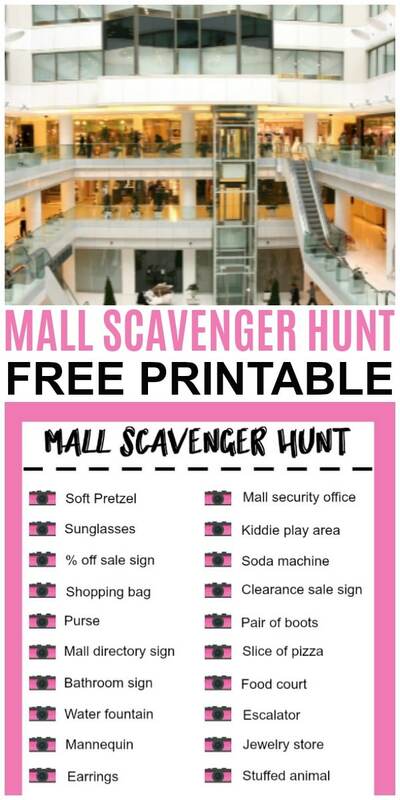 You can download and print off a mall scavenger hunt list for your own personal use. If you think your family will want to do this more than once be sure to laminate the list and use dry erase markers to check off items as you find them. Don’t forget to PIN this post so you can come back and print these off again in the future!